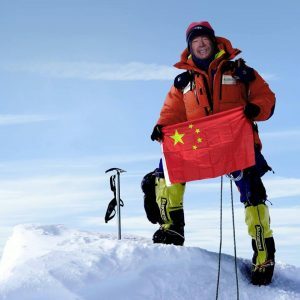 Back in July last year I wrote about this Chinese climber, Zhang Liang, and his achievements in climbing the Seven Summits, skiing to the North and South Poles and climbing the world’s 14 8000m peaks. You can find the blog here. At that time he only had Denali in Alaska to climb in order to complete the Seven Summits. 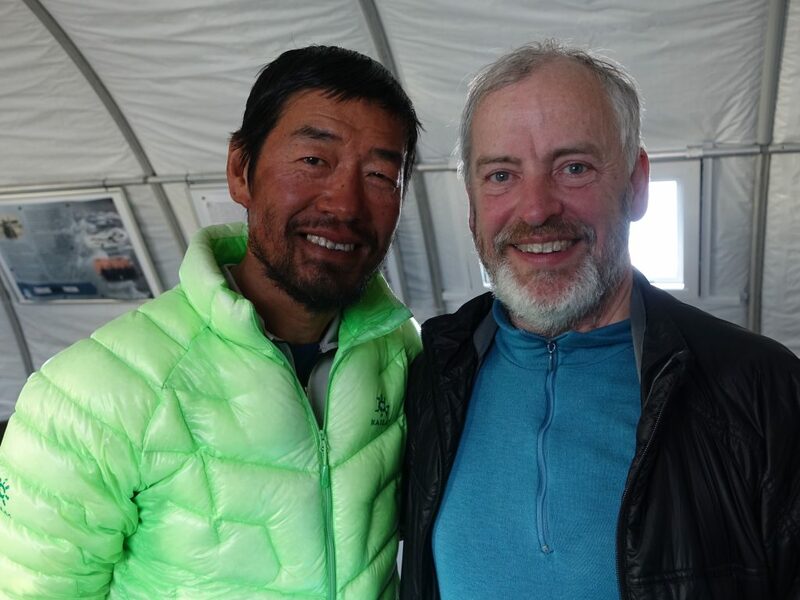 He has now climbed Denali, summiting on 7th June 2018. A report on his achievements can be found here (see 11th June post) and here. There is also a report on a Chinese website (in English) here. The latter report indicates that his Shishapangma summit was “only” to the central summit at 8008m rather than the main summit which is only 14m higher. But a knife-edge, corniced ridge separates the two summits. So it looks as though he will be going back next Spring to attempt the main summit. I will be following his progress. As the FIFA 2018 World Cup begins an interesting link between a Peruvian and a volcano has been reported on by the BBC. Readers of this blog may remember my trip to Mexico and South America in 2014. On the South American leg my brother, Derek, and I started off in Bolivia and we then made our way into northern Chile. 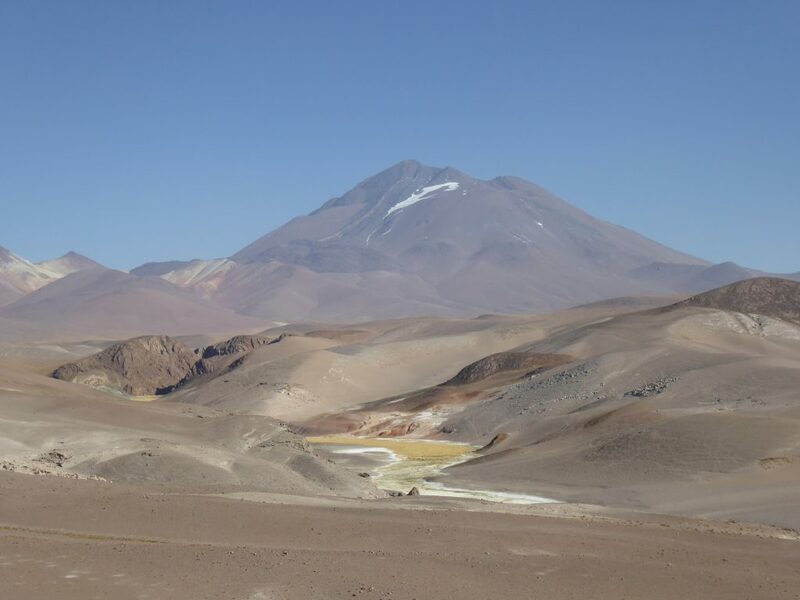 A massive strato-volcano called Llullullaico stands on the Chilean/Argentinian border. In fact it is the seventh highest mountain in South America. This was one of our objectives. One of the reasons I had wanted to climb Llullullaico was that, on the summit, are the remains of Inca buildings. Unfortunately I didn’t make it. A high altitude cough put paid to that. You can read all about that here and here. Anyway, the Peruvian involved is Paolo Guerrero. Indeed he had been the captain of the Peruvian national team and a general national hero. But he became unstuck because at a doping test he tested positive for cocaine. Or more accurately, the cocaine metabolite benzoylecgonine. The result was a 12 month ban. That meant that he would miss the World Cup. His claim was that the adverse test must have been the result of a mix up with tea he was given. “Tea?” I hear you say. Well coca tea is common in South America. Indeed chewing on raw coca leaves is also common (and legal) in many parts of South America. I have to admit to having chomped on them. Basically, you stuff leaves into your mouth and chew them into a paste-like texture and lodge the resulting ball between your teeth and cheek when not chewing. This provides (supposedly) a mild stimulant and assistance in coping with the effects of altitude. I must say that, for me, it did not seem to have any effect other than to make my mouth dry. I soon gave up on its use. It also had no effect on my cough but presumably I would have failed any drugs test taken by me at the time. So what does this all have to do with Llullaillaco? Well you will have to read the BBC report which can be found here. And if Peru win the World Cup, you will now know why. And so it was a couple of weeks ago I decided that for my 17th (yes 17th) time around the Yorkshire 3 Peaks that I would do a night-time jaunt. 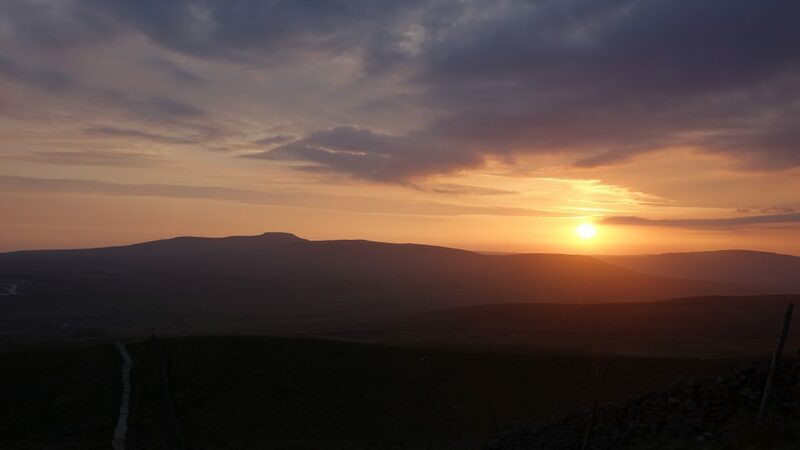 I thought that I could catch the sunset on Pen-y-ghent and sunrise on Ingleborough. Poor old Whernside would be traversed in the dark. Well it almost worked out like that. Leaving Horton-in-Ribblesdale at 8pm I had about 1¼ hours to reach Pen-y-ghent’s summit. I normally manage this section in an hour or so. And so it was that I watched as the fiery sun sank to the north of Ingleborough’s silhouette. Unsurprisingly perhaps I was alone to enjoy the spectacle. There was enough light to descend off Pen-y-ghent’s western flank. A new flagged path has been constructed in the upper parts to save the hillside from the thousands of feet that pound around this challenge. At this point the path also forms a part of the Pennine Way. A new moon hung ahead of me. It gradually sank in the sky as I proceeded towards Whernside. The path is well made and mostly easy to follow. I was not going to follow the original route over the bogs in the dark. Soon my head torch was on. Creatures loomed in the dark – sheep, no doubt surprised to see a human at this time. Occasional birds cried across the lonely moor. At one point the “made” path ends and I felt my way across this section, previous knowledge being vital. Larger beasts loomed, crunching (or so it seemed). But they were disinterested cows. And so I pass Dismal Hill and over God’s Bridge and then Nether Lodge which is cloaked in darkness and through the farmyard at Lodge Hall which is also dark but a couple of collies shut up in a sheep trailer make sure the world knows I am about. I emerge on to Gauber Road. One car shoots past me, the only sign of human life until I reach Ingleborough. I am Ribblehead at midnight. I don’t see the railway viaduct until I am almost at it. Again I follow the “new” route to Bleamoor Sidings. The signalman’s house is dark but lights blaze in the signal box itself. A track testing train rumbles by, its headlights dazzling my eyes that are now accustomed to the night. I pass over the aqueduct at Smithy Hill and start climbing. I am now tired, through lack of sleep rather than physically, and I plod slowly on. There are no sheep here but I hear the noises of the hillside and feel the chill of the night breeze. I turn west off the Dales Way and in 10 minutes I am back on flags. This eases the way up on to Whernside’s long summit ridge. It is around two in the morning. I am almost out on my feet. The tarn to my left shows a silvery sheen. The summit seems a long time coming. The breeze is now in my face. I squeeze through the wall to the trig point and the adjacent wind shelter. Looking to the north east there is the first hint of the new day, a red tinge on the horizon. I sit in the shelter, put on the rest of my clothes including gloves and take out some snacks and water. I will have a rest here. I lie uncomfortably on the narrow stone seat, body twisted. I close my eyes. I hear rustling in the wall – a mouse. I relax. 20 minutes later I wake shivering. But the stop has done me good. It’s ten to three and I leave. I make good progress further along the ridge. The descent to Bruntscar is slow. The path is poor – no place to twist an ankle or worse, at least at this time of night. In a few hours, this path will be swarming but I take care. The light from my head torch is losing the battle to the growing daylight. The camp site at Philpin is full but no-one stirs there. I pass by the Hill Inn and take the path immediately beyond it. The grass is short and cropped. The sheep are back. I wind my way up through the limestone pavement, turn left and am back on a flagged path. I remember the days when this was a bog trot. Now I skipped over the squelch to the foot of the short sharp rise at Humphrey Bottom. I have a brief rest here, and more to eat and drink. I am not going to make Ingleborough summit for sunrise. Soon I am up the steepening and then up another new path towards the summit plateau. I can see Whernside across the valley. As I emerge on the plateau, the sun is just popping over Simon Fell. It is five twenty five. I see the summit shelter ahead. I also see a person. He makes his way towards me and he introduces himself as John. He had come up for sunset, gone back to his tent lower down the hill and come back up for sunrise. I told him what I was doing and he agreed that I was the mad one! He left me. Alone again I took a few photos of first Pen-y-ghent. I leave crossing the stony plateau and down to where the path splits for Horton. Most of the summit area is a scheduled ancient monument. If you look hard enough there is evidence of buildings and ramparts. Warmth is now in the air and the breeze is dying. John is ahead but I do not catch him and he leaves the path to where, presumably, his tent is. A runner then passes me near the ruined shooting hut. I have a last look back at Ingleborough. It is then past familiar landmarks. The Pennine Bridleway, Sulber Nick, more limestone pavements, the edge of the access land and finally the meadows down to Horton. The air is still. More cows lazily munch on the grass within a couple of metres as I pass. One tosses her head, but none are interested in me. By now I am passing walkers heading the other way. It is going to be a busy day on Ingleborough. It is also going to be a hot day. I cross the rail track at the station. Not a cloud in the sky! Horton is heaving. The Yorkshire 3 Peaks will be busy. I reach the car and crash out for a couple of hours dreaming of red and orange horizons, the calls of the night and sheep in the dark. Thank you for taking the trouble to read this blog. You can find out more about me by clicking on the “About Me” tab above. 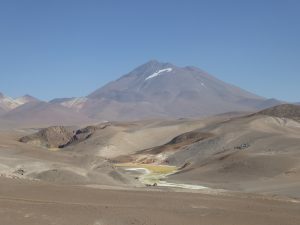 The blog started out just as a mix of mountain climbing and other travel reports interspersed with a few random musings prompted by a trip that I made to Mexico and South America in November and December 2014. You can find details of that trip using the Tags and the Archive below. It has since developed into a bit of a resource on the Volcanic Seven Summits. For this the best place to start is probably here. Comments are welcome!